ATLANTA -- Volunteers spread out Friday trying to find any ballots that could help Democrat Stacey Abrams close the gap against Republican Brian Kemp in their unsettled, too-close-to-call race for Georgia governor. Unofficial returns show Kemp with an advantage, and he's already resigned as secretary of state to start a transition with the blessing of the outgoing GOP governor, Nathan Deal. U.S. President Donald Trump weighed in with a tweet that said Kemp "ran a great race in Georgia - he won. It is time to move on!" Yet Abrams, who hopes to become the nation's first black female governor, sent out volunteers and campaign staff in search of votes that she hopes could still tilt the margin toward her. In a frantic effort to make sure every possible vote is counted, dozens of volunteers converged on a warehouse-turned-phone bank near downtown. The goal: reach voters who used a provisional ballot to make sure they take steps to ensure their vote -- for Abrams or Kemp -- is counted by Friday evening. Helen Brosnan of the National Domestic Workers Alliance stood on a chair and shouted, "How many calls do you think we can make? Can we make hundreds of calls? Let's do this!" Abrams' lawyers also are exploring options to ensure all votes are counted. Her campaign leaders say they believe she needs to pick up about 25,000 votes to force a runoff. Marisa Franco, 27, saw a friend's Facebook post about the effort, then showed up at the warehouse to volunteer Friday morning. "I think that it's really central to democracy that everybody who is eligible to vote can vote and has the least amount of barriers possible, so I'm just here to make sure that every vote counts," she said. Races for governor and U.S. Senate also are tight in Florida, which Trump referred to in a tweet that said: "You mean they are just now finding votes in Florida and Georgia - but the Election was on Tuesday? Let's blame the Russians and demand an immediate apology from President Putin!" Returns show Kemp with 50.3 per cent of almost 4 million votes, a roughly 63,000-vote lead over Abrams. That's a narrow sum, considering the near-presidential election year turnout, though sufficient for the majority required for outright victory. Kemp said Thursday that it's fewer than 21,000 -- almost certainly not enough to force a runoff. 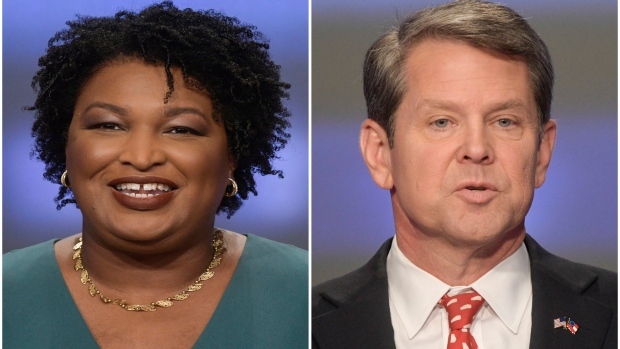 Abrams' campaign argues the total could be higher, and the secretary of state's office has shared scant details as officials in Georgia's 159 counties keep counting.